This movable playpen with a removable rocker will give you an opportunity to move together with your baby around your home or apartment. The separate vibro-modules will help you easily lull your baby to sleep. The rocker-seat is equipped with fairly flat runners. 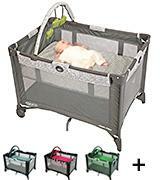 This pack `n play will be useful for the whole child`s adolescent period. It is a perfect choice for small flats and for parents who prefer versatile appliances. In addition, you can turn on the music or a night light for your baby. Available in 2 colors. This model can be used both as a simple playpen and as a crib. And you can take the portable changing table with you wherever you go. The Play yard with all its elements can be compactly put into a bag. You can comfortably carry the bag hanging it on a shoulder. Thanks to the set, this item will be very useful for families leading an active lifestyle. Moreover, it is extremely light in weight. First of all, it is oriented on newborns, but it will also be good for older kids. There are four colors to choose from. Due to the special fastening with a lock, you can turn over the napper/changer at any time to get the needed surface: for hygienic procedures or changing clothes, or just for sleep. The changer surface is slightly angled. The combination of a reasonable price and wide functionality will please every parent. This playpen will be your useful assistant, helping you to look after your baby properly and giving you and your kid maximum comfort. There are five colors of the model to choose from, and 3 toys on the toy bar are of the same color as the playpen is. The wheels and feet fold automatically, which significantly simplifies the process of assembling and saves your time and effort, accordingly. You may find the bassinet board a bit stiff. 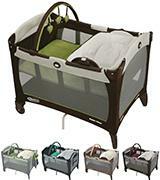 Parents who need a pack `n play with basic functions will certainly appreciate this model. Like the majority of similar appliances, this one will be useful for both newborns and older children until they grow to 35 inches. A toy bar is a nice complement for entertaining. There are 7 available colors for your choice. With this playpen, you will be able to arrange a safe and comfortable gaming place for your little one anywhere. At first, when folding, the parts may seize. If you are looking for a conventional play yard without additional accessories, then this model is the best option to choose. 9 available colors from monochrome coloring to bright floral prints guarantee that you will find exactly the one you like best. The Graco Pack 'n Play Playard Bassinet Changer with Cuddle Cove Rocking Seat is one of the most multifunctional models in its class. Purchasing it, you get a bassinet, a rocker, a changing table, and a playpen at once. 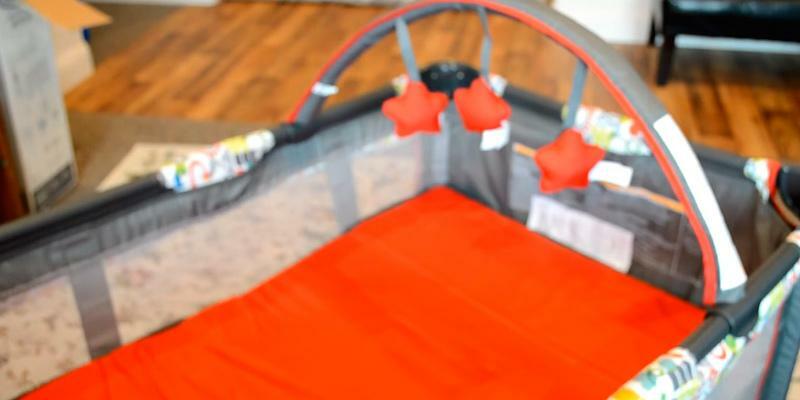 Let's look at the additional features of this Pack 'n Play in detail. You can use this unit as a bassinet from the very birth of your baby and until he weighs 15 pounds (~ 5-6 months). Still, it is recommended to go by the weight and progress of your kid's development. Thus, if your baby learned to turn over and chin up, either stop using the Graco Pack 'n Play for sleep or keep your eye on the kid. For that, you can use a baby monitor. 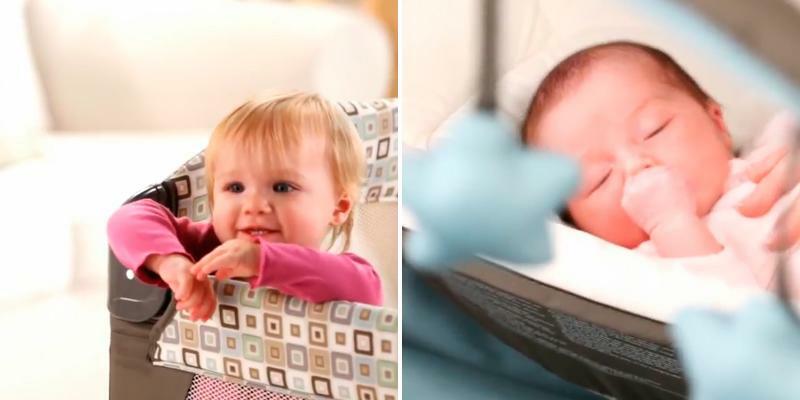 This device notifies you when the baby is already awake. Using this model as a crib, you will certainly like the function of vibro- and musical accompaniment. It is made in the form of a removable module that is attached to the playpen edge. The module performs several functions: creates soothing vibrations, reproduces the sounds of nature, and can be used as a night lamp. For sure, the Graco Pack 'n Play Playard will bring a lot of benefits both for a kid and for parents. Baby rockers/bouncers are very helpful for many parents in the first months of a baby's life. 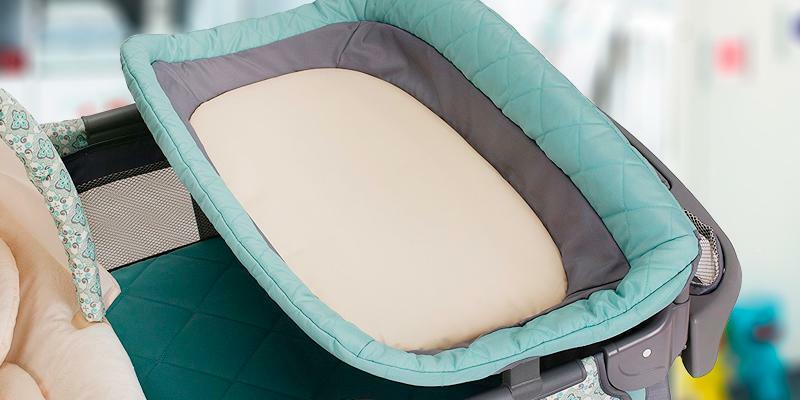 Purchasing the Graco Pack 'n Play, you get the Cuddle Cove Rocking Seat included in the set, so you will not have to spend any extra money. You can use the rocking seat separately or attach it to the playpen. It is worth mentioning that the rocker is equipped with an individual vibro-module so that you can lull a toddler in any room of your house. Since the seat is located at an angle, it is better to put the baby there not earlier than from the age of 3 months. For greater safety, the rocker is completed with three-point seat belts. This accessory comes in handy when a mom or dad needs to do some chores around the house and does not have a possibility to constantly watch the baby. 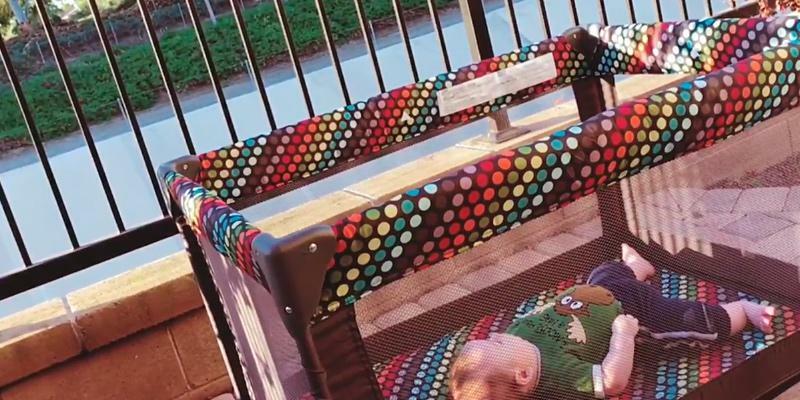 Let's consider another additional feature the owners of this Pack 'n Play get. At first, you will have to change diapers and clothes of your little one up to 10 or even 12 times a day. Thanks to the removable changing table and three netting cubbies for the kid`s essentials, you can arrange a convenient and safe place to change your baby`s clothes, saving room in the nursery. And soft raised table edges will create for a kid the comfort necessary when changing a diaper. The birth of a child no longer hinders the active lifestyle of his parents. And such appliances as the Fisher-Price Ultra-Lite Day and Night Play Yard are very helpful for moms and dads who are into traveling. Being extremely light in weight and compact, this pack and play playard is very easy to carry around. 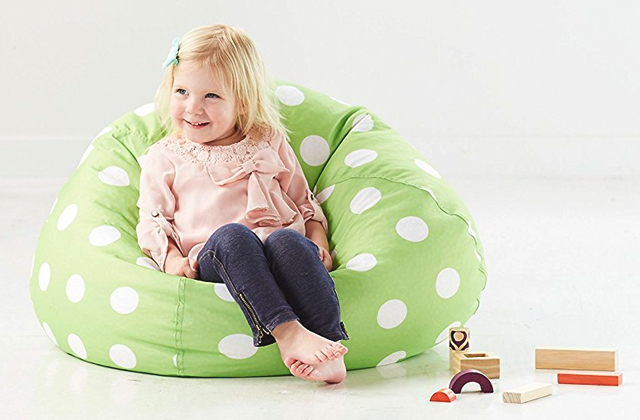 The set includes a convenient carry bag for a folded playpen which you can easily sling over your shoulder. Thus, you have your hands free to hold your little one in an infant car set or other useful on-the-go things (for example, a diaper bag with all the essentials). Moreover, the kit includes a clutch which is transformed into a changing pad with a built-in storage compartment for wipes. Owing to that, you are always "armed" and ready for any possible situation on a trip. With the Fisher-Price Ultra-Lite Day & Night Play Yard, you will feel confident and calm regardless of whether you are going to visit your grandparents or you plan a vacation abroad. The Fisher-Price Ultra-Lite Day & Night Play Yard offers useful functions for parents at any time of the day. 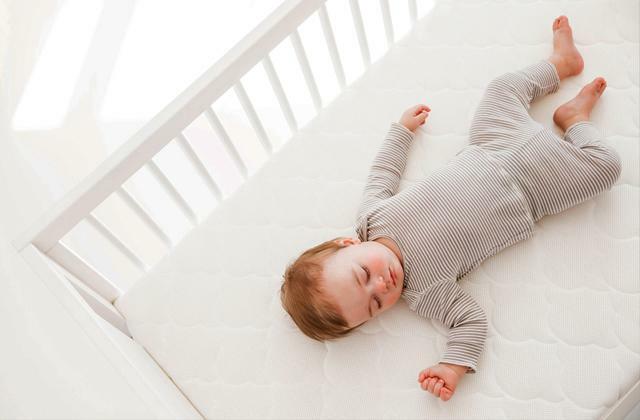 Thanks to a special accessory, in a few seconds the playpen transforms into a comfortable cradle for the safe and comfortable sleep of your little one both during a day and at night. The three-point seat belts prevent the accidental overturning of your baby while sleeping. However, remember that you can use this appliance only until the baby learns to chin up. And, of course, when your toddler is awake you could put it in the playpen with a bunch of toys so that he can play. The walls are made of mesh, so there is sufficient air circulation inside. Also, it enables you to monitor what your little one is doing. There is a convenient compartment on one side of the playpen to put necessary things. Certainly, the Fisher-Price Ultra-Lite Day & Night Play Yard will be a helpful assistant for parents of both a newborn and children of older age. Everybody knows when you have a child cleaning of everything around never ends. And the older your kid is, the more extensive your sweep-up becomes. It is like to clean snow while it is continuously going. Thus, to reduce your time and effort, it is reasonable to choose as easy to clean appliance as possible. And the Fisher-Price Ultra-Lite Day & Night Play Yard is just such a thing. All the surfaces of this playpen can be cleaned with a wipe. Moreover, you can wash the inclined sleeper pad and changing station clutch in a washing machine. It also should be mentioned that the inside surface of the changing mat is made of vinyl. This material can be cleaned just with a wipe which is a great plus. The Fisher-Price Ultra-Lite Day & Night Play Yard will make taking care of your kid much easier. A lot of pack 'n plays offer additional accessories which function as a bassinet, a changing table, and so on. Of course, it is a big advantage, but the more additional elements the more difficult it is to customize the appliance for your needs. Especially, when you are holding a baby. The Graco company did their best to make this model as usable and ergonomic as possible. 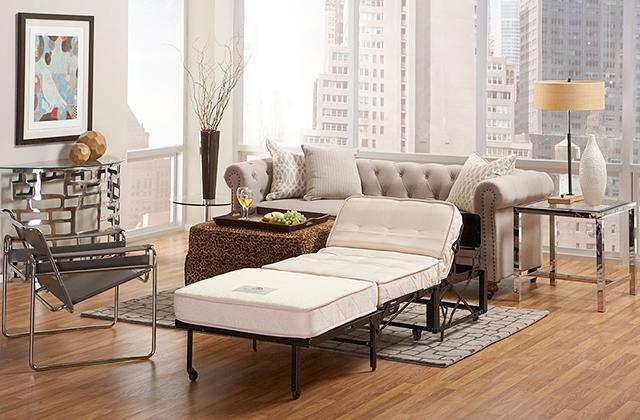 The napper for snooze can also serve as a changing table. Just push the button and turn it over. 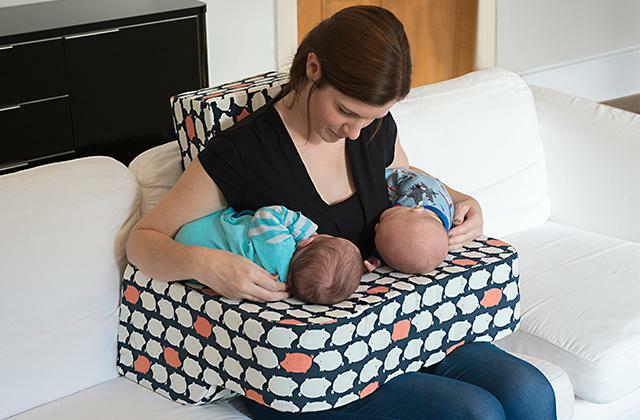 There is a special lock which reliably holds the accessory in the needed position, so the napper will not accidentally turn over with your baby in it. One more benefit of the Graco Pack 'n Play Playard is a toy bar with soft toys. It will be a nice entertainment for your little one while he is lying in the bassinet. As we have noted before, this pack `n play provides pretty wide functionality for sleep, games, and for hygienic procedures. In all these situations, this appliance will give maximum comfort for your child. The coating of the changing table is pleasant to touch, resistant to dirt, and can be easily cleaned with a wipe, which certainly will please all parents. Also, there is a diaper pail to have everything at hand. As for the napper-side, its surface is made of a soft fabric with some stuffing. It is a kind of a "cozy spot" for a baby to spend hours of daytime sleep. 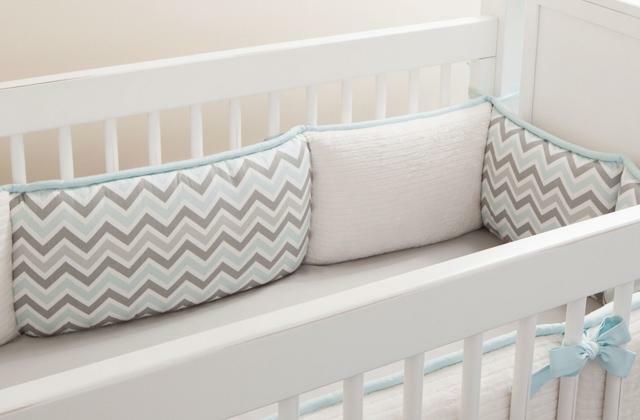 The soft pad can be used on the bottom of the playpen to create a convenient place for games and in the bassinet as a mattress. 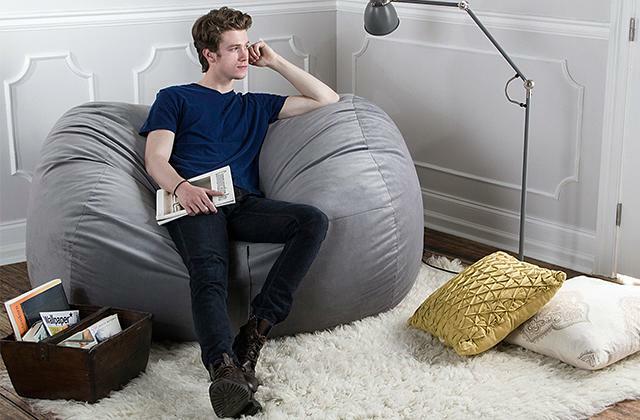 The pad upper side is covered with a gentle cloth to ensure necessary convenience. This pack and play playard is rather mobile, so you can take it with you and your kid will always be under parental supervision. 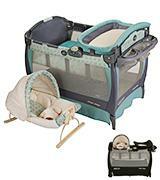 With this Graco Pack 'n Play, your little one will certainly experience only pleasant sensations. 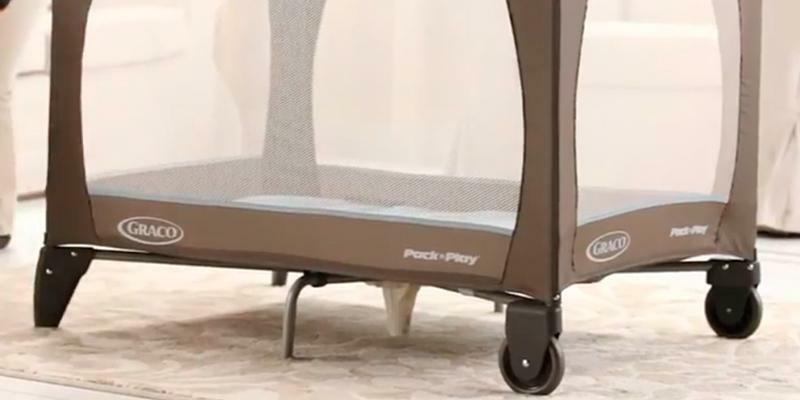 A lot of owners find this design extremely practical, especially considering the possibility to move the playpen around the house without the necessity to fold and unfold it every time, thanks to its wheeled design. 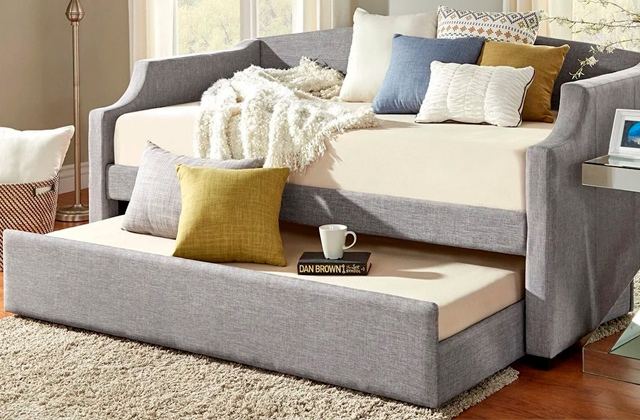 Thus, you have at hand everything you need in any room: your baby can sleep in the bassinet, or you can change a diaper if needed, and later the playpen will be a clean and safe place for games. 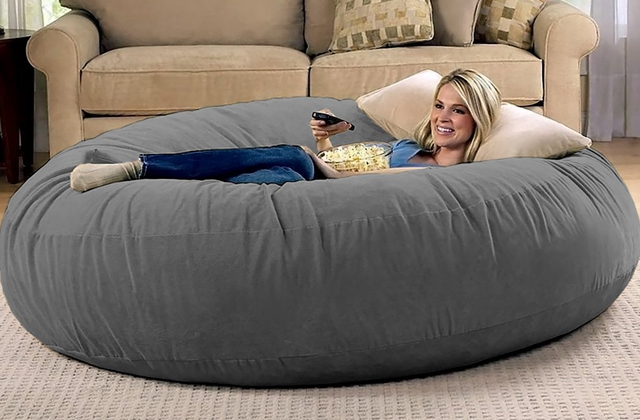 If you like, you can even put a baby gym on the bottom. It is good not only for entertainment but also for baby's development. Just remember to watch the kid, in this case. It should also be mentioned that, like all similar models, you can take this pack `n play with you on a trip. By the way, the set includes a comfortable travel bag for that. This appliance will be useful from the birth of your baby and until he reaches the weight of 35 pounds or the height of 35 inches. 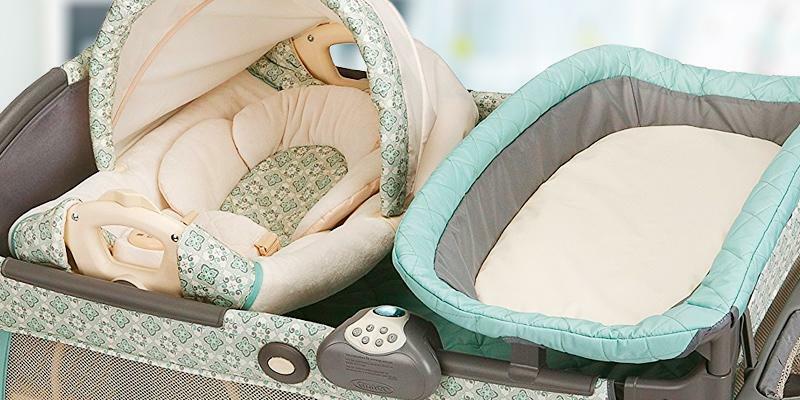 Indeed, the functionality and comfort you get purchasing the Graco Pack 'n Play Playard with Reversible Napper and Changer are worth every penny. If you need a simple model with basic functions, then the Graco Pack 'n Play Playard On The Go will be your perfect solution. 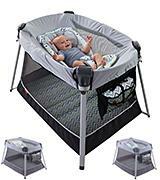 This appliance provides a bassinet and a play yard, which you can easily move around the house and take on long trips. 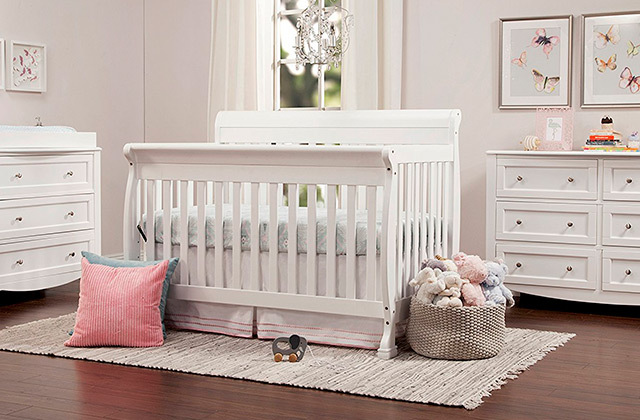 For greater safety while sleeping, the bassinet is securely attached to the walls of the pack `n play. 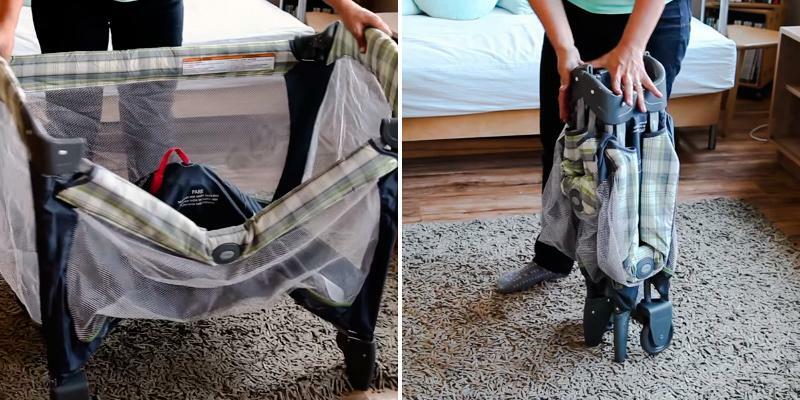 The frame is made of metal tubes that form the bottom of the bassinet where you put the pad (it also can act as the playpen bottom). The pad is rigid enough to allow your little one to safely sleep on the back, and the mesh walls provide perfect ventilation. So, if you want to use the Graco Pack 'n Play as a play yard, you need to remove the bassinet and put the pad on the bottom. 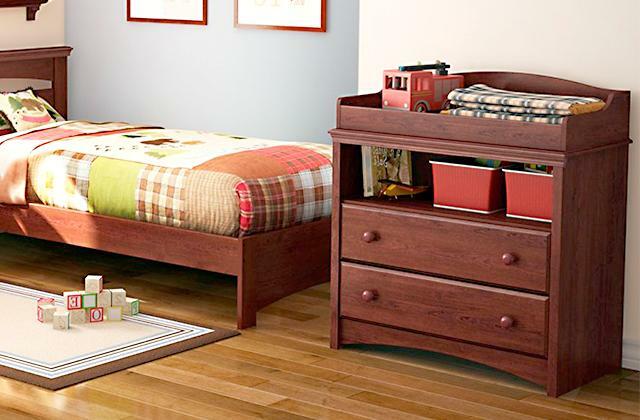 This way, your kid will have enough room for games and at the same time will not be able to reach any dangerous things. Some users consider the pad too harsh, but do not forget that very soft surfaces are not recommended for safe sleeping. 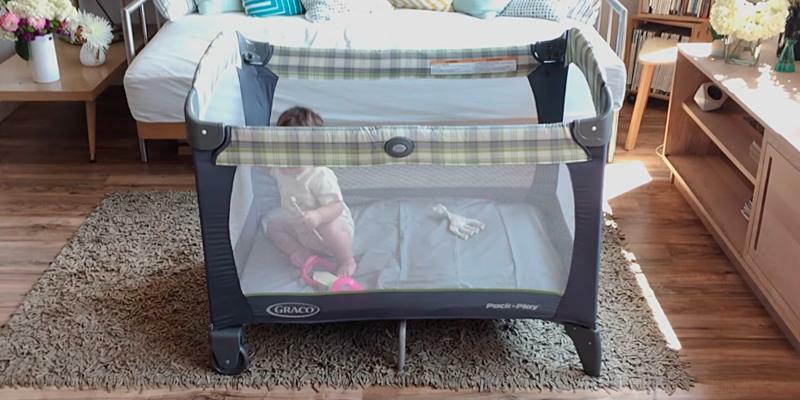 If you are going to use this Pack 'n Play only in the situations mentioned above and you have already purchased a changing table, then the Graco Pack' n Play Playard with Automatic Folding Feet will become a really practical solution for you. 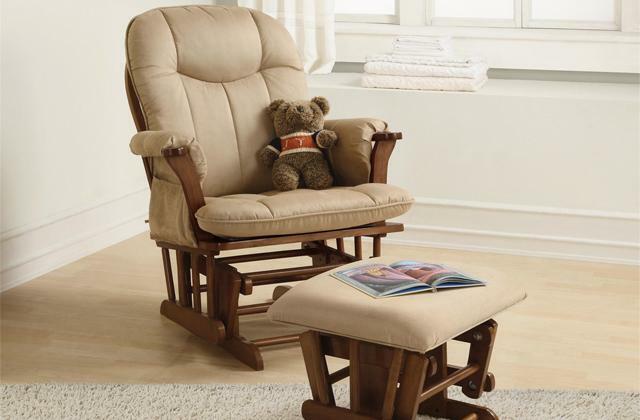 Also, to lull your baby and help him to catch a nap at home or away, you could additionally purchase a baby swing. Basically, the Graco Pack 'n Play Playard with Automatic Folding Feet is folded in a traditional way. However, you should keep in mind some aspects. First, take away all accessories from the play yard. Before unlocking the upper rail, you need to pull the loop located in the center, and only after that press the unlock buttons. In addition, this model is equipped with automatically foldable feet and wheels. Having practiced a few times, the assembling will take minimum time. Thus, with a few movements, you can fasten the assembled playpen with the pad. It is very convenient for storing the appliance if you do not use it too often. And if you would like to take it with you on a trip, it is better to pack the play yard in a special bag (comes in the set). This way, transporting will be easier and your pack the play yard will stay clean. 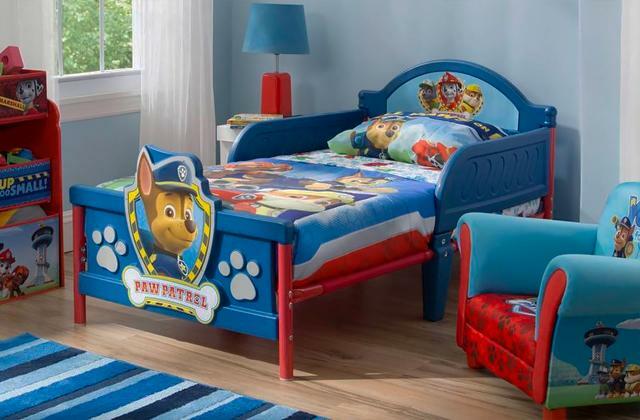 Manufacturers of kids' products and furniture always try to make the color range as wide as possible. And the Graco with their Pack 'n Plays is not an exception. As for the Pack 'n Play Playard with Automatic Folding Feet, it is available in 7 colors, from calm and faint gray model to a more colorful version of a black playpen with a bright pink pad. It is also worth mentioning that, if a Graco model is equipped with a toy bar with removable fluffy toys, then this accessory is made in the same color. Soft toys can be designed in form of stars, different animals, clouds, or leaves. For sure, every parent will have a chance to choose the best option for their child. The Cosco Play Yard is a traditional kid playpen that is designed to provide a safe and clean place for your child's playing. If you have a newborn, you can put him in the play yard and your little one will watch the spinning toys and maybe even have a nap during the day. Since all four walls of the play yard are made of see-through mesh, you can look after your kid all the time. When your baby gets older, you can put into your playpen some age-appropriate toys like wooden blocks so that your kid has something to play with and you have time for some other chores. Thanks to the wheels on one of the sides, you can take the playpen out in the yard. 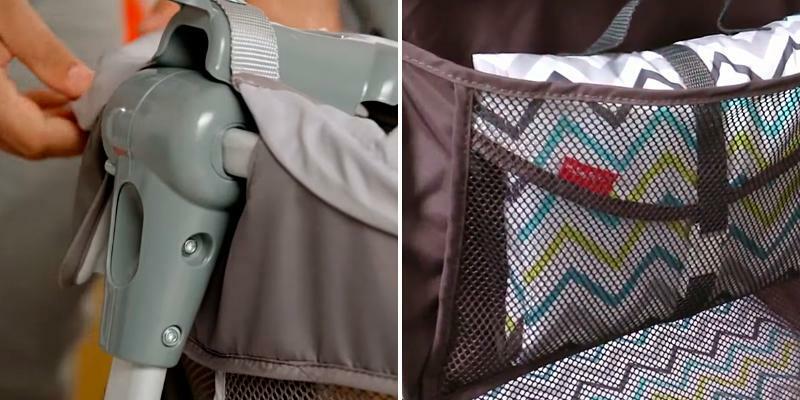 And, of course, you can put your pack `n play at any time in a carry bag (comes in the kit) and go off with your baby on a journey: maybe to the nearest park, carrying your kid in a baby carrier, or much further. 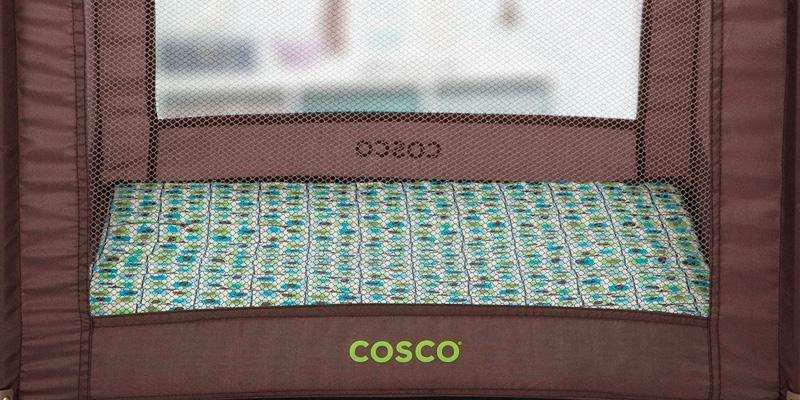 A lot of owners note that the Cosco Play Yard can be easily folded in just a few moments. And despite the fact that unfolding is a little more complicated since the rails can get stuck, this baby play yard is quite good in terms of practicality. In addition, this appliance is fairly light in weight. The wheels and feet are made of plastic, so it is recommended to place the playpen on a carpet or other non-slip surfaces. Also, after using the play yard outdoors, remember to carefully clean it from sand to prevent it from getting into the mechanism. It is worth noting that the playpen bottom is not that soft. On the one hand, it is safer for a kid, but on the other hand, it may seem not comfortable enough. However, for security reasons, the manufacturer does not recommend putting pads inside. Thus, if you still want to purchase an additional pad, take one which will fit the play yard (it should lie tightly ) and have the thickness of up to 3 cm. And, of course, you should constantly keep tabs on your little one. Like most manufacturers, the Cosco company offers play yards in several color options. And although surfaces of all play yards can be easily cleaned with a damp cloth, before purchasing a light colour model, better think twice and decide where you're primarily going to use it. If you intend to often take it with you on trips, it's better to choose a completely black model or the one made in dark colors. And if you are looking for a play yard to use indoors, you can select a lighter version, for example, an elephant squares model or a posey pop with pink elements. Generally, there are 9 available options, so you will certainly find the one to suit your needs and preferences best. 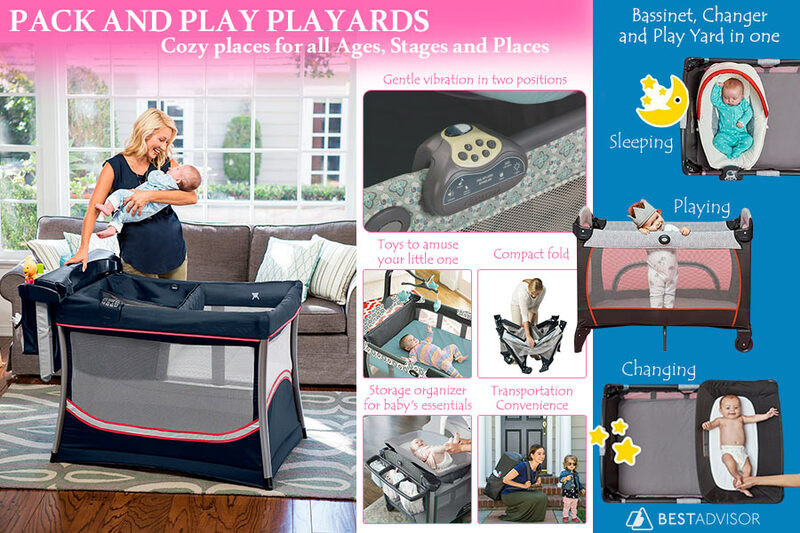 What Is a Pack and Play Playard? All parents whose kids reach the age of an infant or toddler find a playpen a real blessing. Playpens are a great piece of furniture which provides children with space for playing and keeps them protected from dangerous surrounding objects. Today you're likely to often hear the name Pack `n Play which refers to a slightly modified version of a playpen. 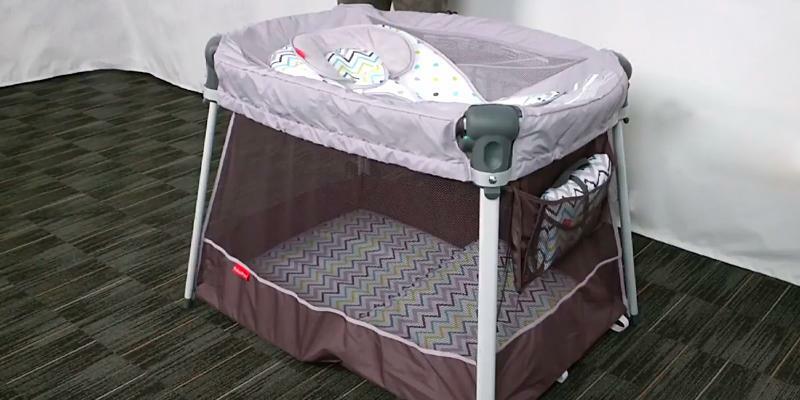 Unlike old playpens, pack `n play models provide not only space for entertainment but also can serve as a crib, come fitted with a changing table and include some other elements for child entertaining. It comes as no surprise, they are gaining more and more popularity among families with children. In our review, you'll find the best 5 pack `n playards that are present on the market today, as well as find some helpful guides that will help you pick the right one. Kids are growing all the time, and there's always something to buy. Make sure to look through our best selections of kids' products and read those that you are most interested in. When choosing a pack `n play, first of all, think about the functionality you need. The diversity of models gives you an opportunity to find the most convenient set to provide your child with a place for sleeping, playing, and changing clothes. Or you can select a simple portable playpen to take with you when you visit your grandmother, or just go outside. Children grow very quickly in the first year of life, so pay attention to the maximum load that a pack n play is able to withstand. The pack n play should be mobile and portable so that you can take it on trips or somewhere else. It should be easy to move both indoors and outdoors. 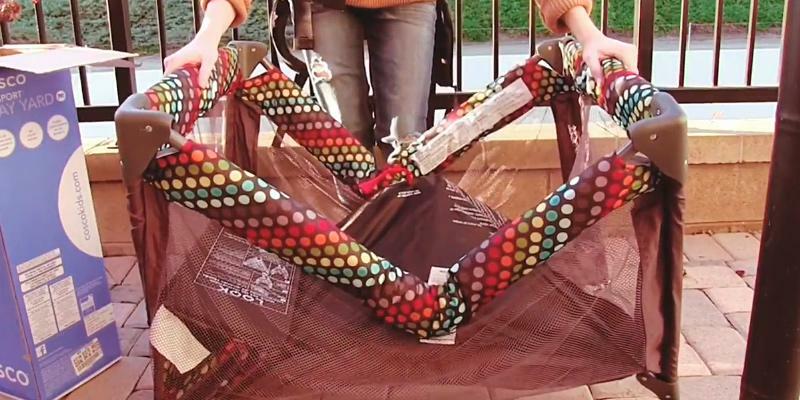 Thus, you should be aware of the characteristics that contribute to this feature: simple assembling, the presence of a cover and wheels to relocate your pack and play playard without any efforts, etc. One more aspect to pay attention to is the playpen size. Of course, safety is of great importance. The wheels must be equipped with stoppers and the frame must be strong and durable. The JPMA certificate guarantees the quality and security of the pack n play. Additional features making the pack n play even more comfortable in use are not necessary, but very desirable. These can be a cubby to store various trivial things or a removable toy bar controlled by the console, for example. Some models may come equipped with a module creating vibrations or playing tunes for lulling your baby to sleep. Q: How to accustom a child to a pack and play playard? A: You should start doing it before your child can sit unassisted. Put your little one in a play yard for a few minutes and leave him alone. Make sure to leave in the play yard some "exclusive" toys which your child can see only there and nowhere else. After 5 minutes, take your child back to bed. You shouldn't leave a newborn in the play yard longer than that, especially during this period. Gradually, your kid will understand that he spends certain periods of time in the play yard and then his parents return and take him out of it. Increase this interval little by little so that your child can get accustomed to staying alone in a play yard without the feeling of discomfort. Your child should be aware that his parents do not leave him nor do they punish him this way, and that they go only because they do not want to interfere with his playing. Q: What are the types of a play yard? Q: Which baby play yard is better to select? - the need for quick assembly-disassembly and transportation. Q: How to transport a pack and playard? A: First of all, a pack and play playard should be disassembled. Otherwise, you may run a risk of damaging it during transportation. All parts and accessories should be packed properly. If you're planning a long trip abroad, you may want to consider buying a special carrying bag (which may or may not be included in the set). If you do not want to buy any extras and have a good carboard at home, you can pack a playpen in it instead. Make sure to fasten the bag when traveling by car. Q: What shape can children play yards have? A:Play yards for kids are designed in various shapes. You can find models designed in square, rectangular, and angular shapes. Angular-shaped play yards are good for small apartments, where there's no possibility to place a bigger thing. You can also find round- and oval-shaped play yards. The choice is pretty big and you should be able to find play yards to fit any setting. Q: What about the size? A: Talking about the size, ideally, the width and the length of a play yard should be at least 1 m. However, in general, the bigger it is the better. 1. Play Yard Buying Guide, ConsumerReports. May 2016. 2. How to buy a play yard, BabyCenter. April 2016. 3. Heather Corley How to Choose a Play Yard For Baby, Spruce. February 22, 2017. 4. Choosing and Using a Play Yard, What to Expect. 5. Buying Guide to Baby's Playard, buybuy BABY. 6. Alvin Eden How to Choose Baby Equipment, HowStuffWorks. 7. 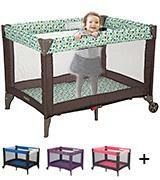 Susan M. Kelly Choosing Safe Baby Products: Playpens, KidsHealth. September 2013. 8. Kate Miller-Wilson Choosing a Baby Playpen, LoveToKnow. 9. Anna Studman How to buy the best playpen, Which?